Where would genealogical research be without the staggering amount of work that volunteers do? From indexing records on Familysearch to documenting headstone transcriptions, and everything in between, volunteers make an incalculable amount of records available to those researching their families. 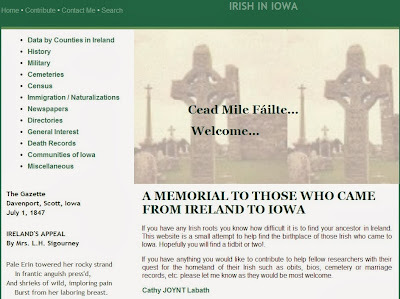 One such example is the 'Irish in Iowa' website, created by Cathy Joynt Labath. Unfortunately, the site has not been updated since 2007, but it contains a large amount of useful information for those with Iowan-Irish ancestors. 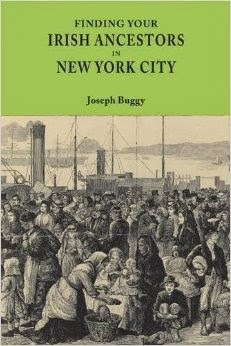 Among many different types of records that she has transcribed, one of the most useful sets is a database of Irish immigrants collected together based on their Irish county of origin. Military, Catholic, census, cemetery, naturalization, and directory records are also present. This website, though, is more than just transcriptions and offers a large amount of information about Irish settlements in many different parts of the state. All in all, this website is an absolute must for anyone who has Iowan-Irish ancestors.